'Inflation' is one of the nine cards belonging to the purple (spirit) group. The 4-mention version of the card available in hard copy has mentions on all four sides, numbers and symbols. 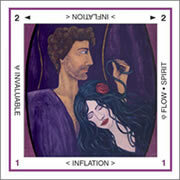 The pack being offered here on the Rainring website consists of 81 cards. Each card carries a single mention only on one side – at south, below the image. This is quite different from the cards available in hard copy, for details of which see the 4-mention cards section. Every card has a coloured border around it, outside the image. This identifies its membership of one of nine groups. The cards are also linked in sets of nine by similar format marks within the image, though these are not always obvious. The cards thus form a 9x9 grid, as shown by clicking here. Readers of the online cards have two sets of options available: First, they can use the cards upright only or choose to mix upright with reversed; Second, they have several spreads available, which are comprised of between 4 and 9 cards. The Visual Directory provides a full-sized image of each card, together with a brief comment on its meaning. This directory also lists cards and meaning without images; catalogues the spreads, the chakras and how we understand them; and lists the themes of both the sets and groups. Please note: in the Visual Directory, reversed meanings are not given. The composition and use of Spreads is explored in the section of that name.